Epson TM-U375 - Impact, receipt, slip & validation printing, 5.4 lps, serial interface. Order cables & power supply/AC adapter separately. See accessories. Color: white. A custom solution to your printing needs - the TM-U375 series features four models, each having different equipment and applications. and, thanks to the TM-U375 bi-directional printing, receipts are issued quickly. Black/Red Ribbon for TM-U200, TM-U300, and TM-U375, Single Ribbon. Black/Red Ribbon for TM-U200, TM-U300, and TM-U375, 10 ribbon case. 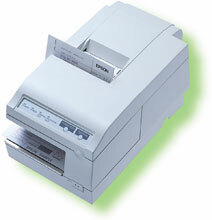 The Epson C159021 is also known as Epson POS Products	EPS-U375011	.